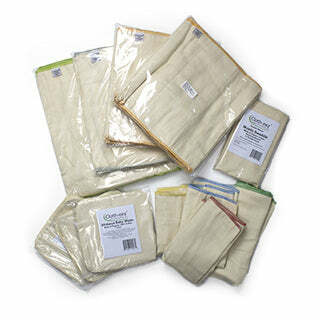 This kit includes a FREE beautiful organic cotton Swaddle and a set of FREE GMD slide lock diaper pins. This kit is for diapers, wipes and a swaddle for newborn baby. It does not include the diaper covers. We recommend about 6 diaper covers to go over the diapers. Four covers is a get-by amount and 8 is really better than 6. Six covers is the common recommendation and it works fine. Again, diaper covers are not included. Definition: The diaper is the absorbent part and the cover is the waterproof part that goes over the diaper. 1 dozen Novice light green edge organic prefolds (Why these? This dozen ensures that you have enough diapers and you don't run out. New babies go through a lot of diapers in a day! Babies also grow quickly so when baby suddenly outgrows the newborn prefolds you have something that fits and you can get them on a new baby even though they'll be a bit big. Although newborn babies still get fed and changed during the night, sometimes babies do sleep a longer stretch and these diapers are bigger and more absorbent than the newborn orange edge so they are great for those times when you can go longer between changes. 1 individual Small yellow edge oganic prefold (so you have both choices of the "small" sizes - novice green and small yellow - on hand so you can decide which ones you want to go with for your next size. 1 individual Medium red edge organic prefold (so you have both choices of the "medium" sizes - intermediate blue and medium red - on hand so you can decide which ones suit your baby's growth pattern when the time comes. 3 packs Cloth-eez Birdseye Wipes made of organic cotton, 12 wipes per pack which is 36 wipes. Some people might want to also buy a 4th pack separately. Diaper covers are NOT Included. You will need about 6 of those. Go to the Diapers Covers page to choose yours. If you just know that you want only organic cotton touching your baby's bottom, this is is a nice setup for the newborn time. Approx. Weight / Age Before Washing Measurements, inches. Sizes shown AFTER FULL SHRINKAGE are approximate. Sizes overlap and are approximate. Link to Prefold diapers. The perfect way to begin! This kit was everything I was hoping for and more. We were able to use the prefolds in this kit for my daughter from birth until three months old. I love that it came with an intermediate and medium prefold as well to give me an idea as to which I would prefer to use when sizing up. Such a great investment and very cost-effective for those looking to cloth diaper. I haven't prepped or used the diapers just yet, but the Newborn package seems to be a great deal! It's a ton of diapers and everything came in swiftly and looks great!